Watch this video of our dashboard to see how it works! Culture change powered by technology is the key to delivering safe, high-quality health care. SwipeSense is a cloud-based sensor network that aids caregivers in the battle against hospital-acquired infections (HAIs) by providing complete transparency into hand hygiene data for each department, unit and individual. Our customer success team partners with hospitals to drive lasting behavior change by implementing positive reinforcement programs that increase individual accountability and improve staff habits. SwipeSense is easy and fast to implement. It requires little involvement from IT teams and is compatible with any existing or new wall dispensers. SwipeSense does not disrupt clinician workflow and relies on proven behavior change methodologies rather than short-term gimmicks like alerts or reminders, resulting in hospital-wide adoption. Accuracy leads to accountability, accountability leads to change. With this in mind, SwipeSense has gone beyond basic testing in ideal laboratory settings. Our system has been clinically validated across dozens of facilities to capture an accurate representation of overall staff hand hygiene compliance. Every hospital employee receives a badge, enabling facility-wide participation to improve hand hygiene performance. Badges are unobtrusive, clipping behind existing ID cards, and last up to 2 years. 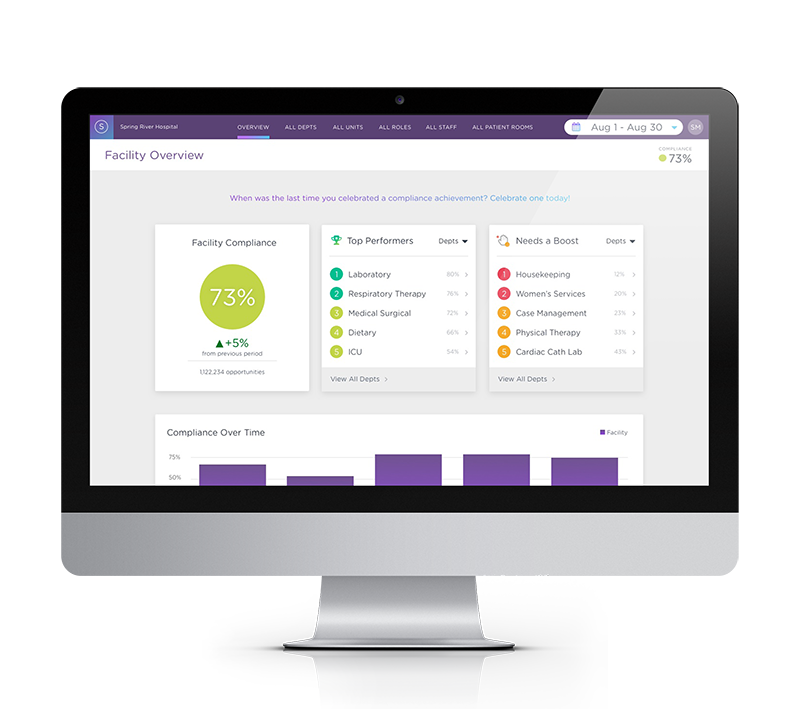 Hygiene events and visits are captured seamlessly without impact to staff workflow. Location Hubs are located in each patient room or care area to continuously capture caregiver visits. This ensures that each recorded hand hygiene event and patient visit are linked to the room where they took place. The Hubs use a single wall socket, making installation simple and inconspicuous. New and existing hygiene dispensers are fitted with a smart drip guard that captures personal usage data. The sensor is vendor agnostic, and works with any existing wall dispenser including gel, soap, foam and motion-activated models. Hand hygiene data is relayed from all devices to Communication Hubs located in centralized work areas such as nursing stations. Data is then delivered over existing hospital WiFi or Ethernet to secure servers for analysis. Communication Hubs require one wall socket for installation. "SwipeSense gave us the data we needed to encourage more diligent behavior."